Protect pets online – if you see something, say something! We all love looking at photos of cute puppies and kittens online! But when those animals are being listed for sale on websites and social media, who is checking they’re safe and healthy? The community expects websites that allow the online sale of pets to actively protect the welfare of these animals, and make sure they’re not supporting poor animal welfare practices (like badly-run puppy farms). Each state and territory has basic legal obligations for the online sale of pets, that retailers must meet – but often, these basic legal requirements do not go far enough. That’s why the RSPCA has developed these Guidelines for The Online Advertising of Pets; in response to demand from the community, and to help websites develop good policies that protect animals and improve consumer trust. While some major classifieds sites, such as Gumtree, meet some of these guidelines, no Australian site that sells pets meets all of the Guidelines. If you know of a website that you believe should adopt the RSPCA’s Guidelines, you can email them using our prepared text below. We need websites that allow the sale of pets to step up and protect their welfare, and proactively enforce their existing policies where relevant. 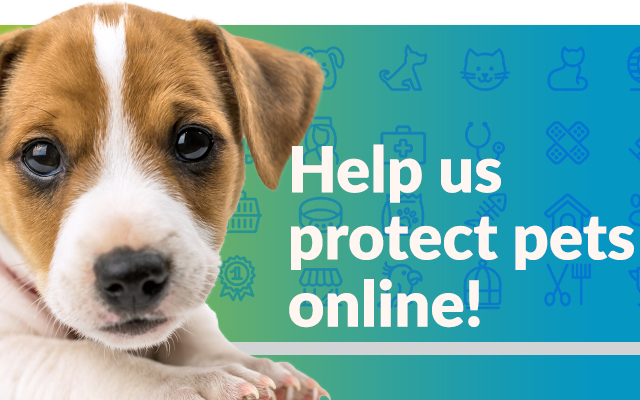 You can help protect pets online. Use our template below to email Gumtree and Trading Post, and ask them to adopt the RSPCA’s Guidelines today. To make your email as effective as possible add your own introduction to the text we have provided. If you see something, say something – if you see inappropriate ads for pets on Facebook or Instagram, report it to the site and comment on the post with the hashtag #SafePetsOnline to let us know. Have you had a near miss or bad experience buying a pet online? We want to hear from you, so that we can help others avoid the same heartache. Email us with your story to supporters@rspca.org.au. If you’re thinking about introducing a dog or cat to your family, remember to check out the RSPCA’s Smart Puppy and Dog Buyers Guide and Smart Kitten and Cat Buyers Guide, which has all the information you need to make an informed decision. Of course, it’s a good idea to visit your local animal shelter too, as there might be the perfect pet waiting there for you to adopt! Use our form below to send an email to Gumtree and Trading Post, asking them to adopt the RSPCA’s Guidelines for the Online Advertising of Pets. If you use another website, and want them to know about our Guidelines, let us know about them, so we can add their details to this page. Hi there, I’m writing to you because I’m deeply concerned about the welfare of animals being advertised, bought and sold online, through sites such as yours. I use your site often. Like many Australians, I love the convenience of shopping online and using the internet to research future purchases. But when it comes to the buying and selling of pets online, there are serious risks, and I think it’s really important we have systems in place to protect the welfare of those animals. The RSPCA estimates that tens of thousands of animals are bought and sold online each year in Australia, through platforms like yours. But at the moment, I don’t think websites like yours are doing enough to protect those animals by making sure the sellers are ethical breeders, and that consumers know what to look for to safely search for a pet online. That’s why I’m very pleased to learn the RSPCA has released Guidelines for the Online Advertising of Pets, and I’m asking you to implement these in full, on your site. I do know that Gumtree has already taken significant steps, and already meets almost all of these Guidelines. By adopting these guidelines in full, you can help make sure the animals advertised for sale on your website have been properly cared for, and ensure people like me can use your site with confidence about the welfare of the pets advertised there. Australians care very much about animals, and we want to know that big companies like yours are doing everything they can to care for and protect pets that are listed for sale. I urge you to adopt and publicly commit to the RSPCA’s Guidelines in full, as soon as possible. Please reply to me and let me know when you will be implementing the guidelines, and anything else you’re doing to support improved animal welfare.